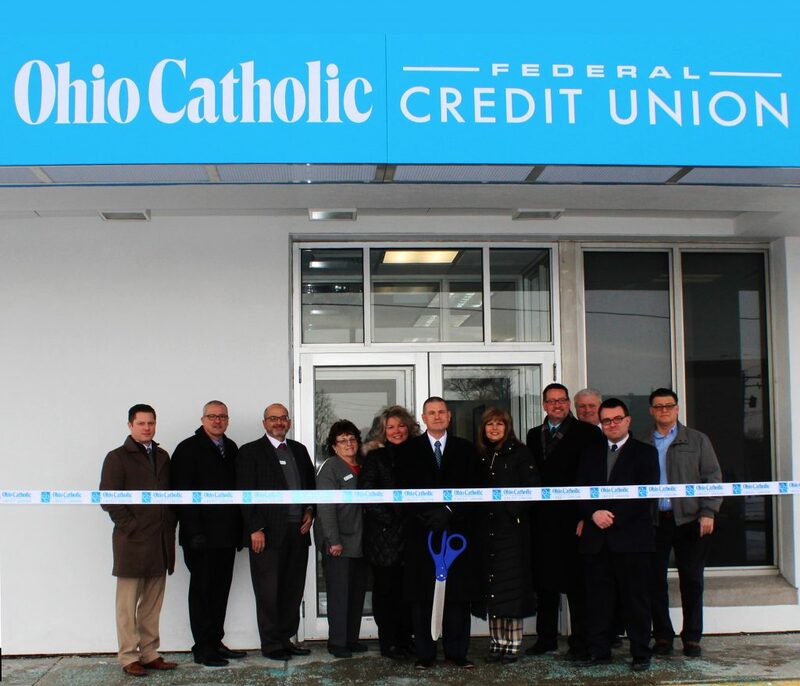 Akron, Ohio – Ohio Catholic Federal Credit Union celebrated the Grand Opening of its new Akron-Canton Regional Branch, located at 2720 South Arlington Road, with an official Ribbon Cutting Ceremony on Monday, January 28. The move from the credit union’s former location on Brown Street provides a larger branch, a drive-up ATM, and two drive-thru teller lanes to better serve the expanding number of Akron-Canton based members. Ohio Catholic FCU is a faith-based financial service provider that can meet the banking needs of both individual and commercial members. As a not-for-profit organization, the credit union exists to serve the financial needs of its members, not shareholders. All are welcome to apply for membership with Ohio Catholic FCU and members enjoy the benefits of low rates and fees on loans, high dividend rates, and friendly, personal service. “We are very excited to move into our new location to better serve the financial needs of individuals and organizations in the Akron-Canton region,” notes Mike Wisnor, Vice President of Marketing & Mission. “We take great pride in being part of the local community and donate 10% of our net income back to the communities where our members live, work, and pray,” adds Wisnor. Since 2014, Ohio Catholic FCU has donated over $750,000 to parishes, schools, ministries, and non-profit organizations to meet the needs of the local community. Founded in 1954, Ohio Catholic FCU is the largest faith-based credit union in Ohio and the fourth largest faith-based credit union in the country with over 13,000 members. As part of the Grand Opening celebration, Ohio Catholic FCU is offering a number of special promotions, raffles, and giveaways for both new and existing members. For more information, simply stop by the new Akron-Canton Regional Branch or call 888-696-4462.